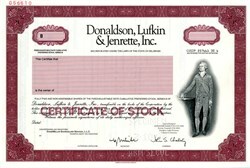 Beautiful RARE SPECIMEN stock certificate from Donaldson, Lufkin & Jenrette, Inc. ( DLJ ) dated 7/10/1998. 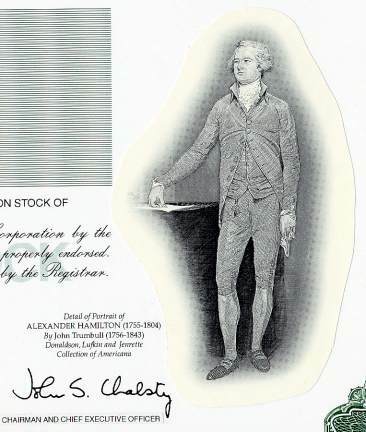 This historic document was printed by the American Bank Note Company and has an ornate border around it with a vignette of Thomas Jefferson. This item has the printed signatures of the Company’s Chairman and CEO, John S. Chalsty and Secretary, is over 30 years old. This is the first time we have had a Specimen stock certificate (not proof) from this company. Donaldson, Lufkin & Jenrette was a leading integrated investment and merchant bank serving institutional, corporate, government and individual clients. DLJ’s businesses include securities underwriting; sales and trading; investment and merchant banking; financial advisory services; investment research; venture capital; correspondent brokerage services; online, interactive brokerage services; and asset management. Founded in 1959 and headquartered in New York City, DLJ employed approximately 10,200 people worldwide and maintained offices in 13 cities in the United States and 16 cities in Europe, Latin America and Asia. On November 3, 2000, Donaldson, Lufkin & Jenrette, Inc. was acquired. The investment banking business of DLJ has been integrated into Credit Suisse First Boston, and substantially all of the asset management business of DLJ had been integrated into Credit Suisse Asset Management.